Who doesn’t love fried cheese? Stuck with a bunch of mustard greens (which are far from my favorite) from my latest CSA share and looking for recipes other than greens with garlic and olive oil, I asked for ideas from Facebook friends. Colin came to the rescue, suggesting saag paneer. 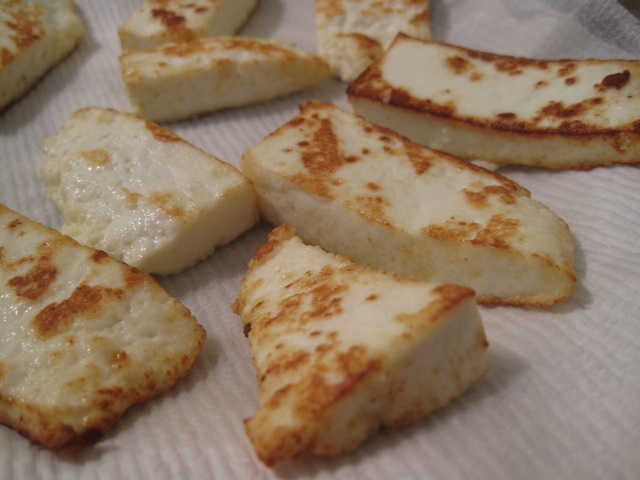 This batch of paneer was the best I’ve managed yet, and the result was delicious. I used this recipe. I didn’t have fenugreek leaves but otherwise I followed the recipe pretty much as written. Next time I’ll at least double the chiles. I used serranos from the garden, which were pretty hot but small. I grew up eating mustard greens (my family is Cantonese.) I hated it as a kid, but grew to tolerate it over time.. My mother tended to boil it in a light broth, and occasionally added a salted duck egg at the end.